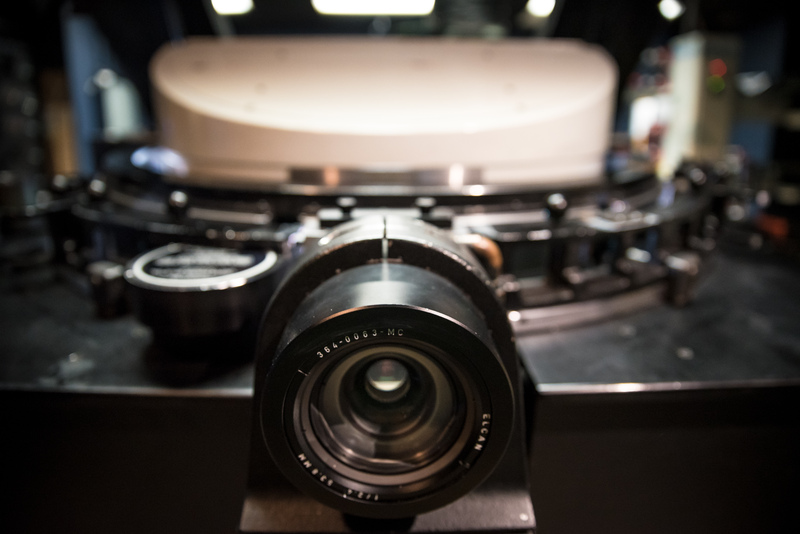 A look Norwalk Aquarium’s IMAX projection room and the labor intensive process of loading huge spools of 70mm film into the giant IMAX projector for The Norwalk Hour. 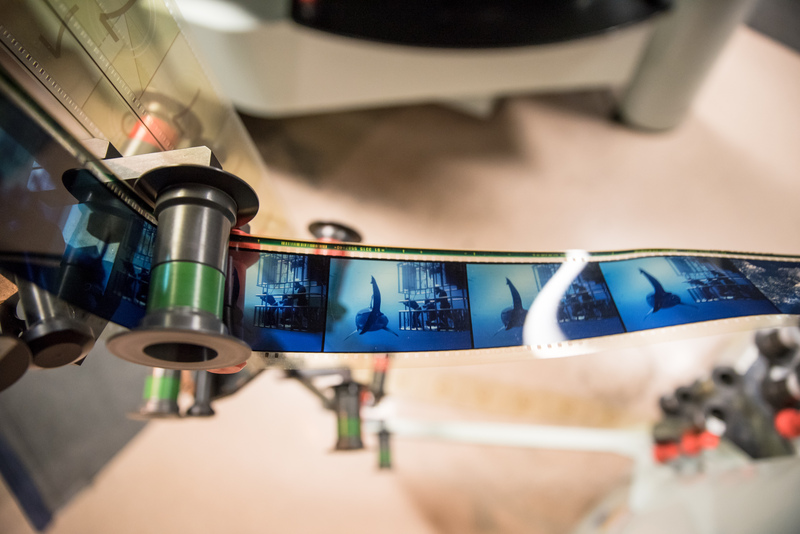 Attached to the front of reels, recycled frames from movies such as ‘Great White Shark’ are added to serve as ‘leader’ which ensure there is enough length for the filmstrip to be threaded from tray to projector, back to the tray. 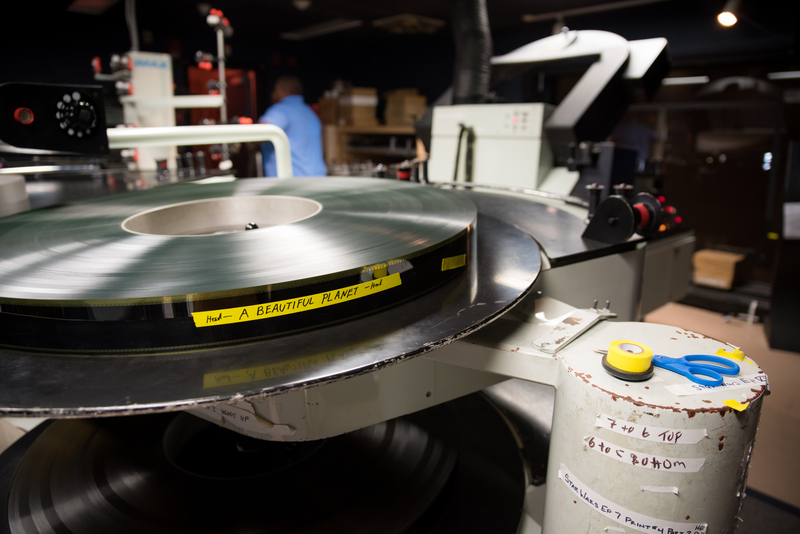 Norwalk, Conn. on May 4, 2016. 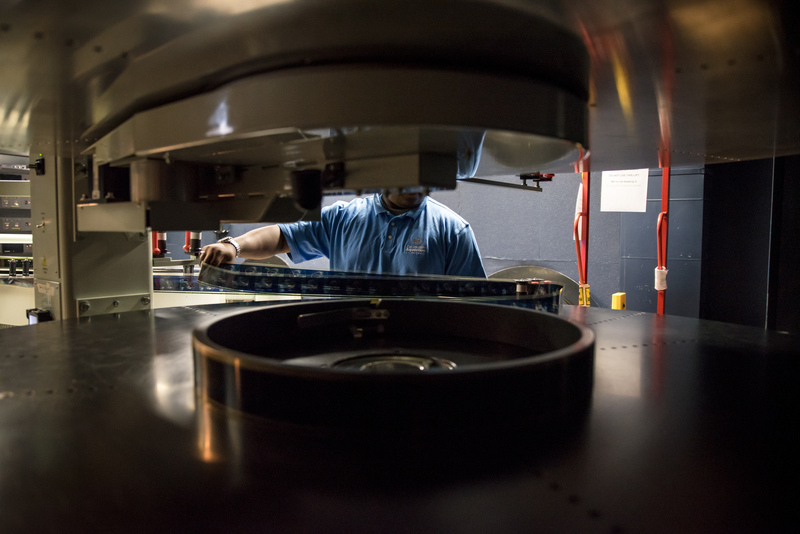 A ‘tray’ of the movie ‘A Beautiful Planet’ on 70mm film inside the projection room in the IMAX Theater at the Maritime Aquairum in Norwalk, Conn. on May 4, 2016. 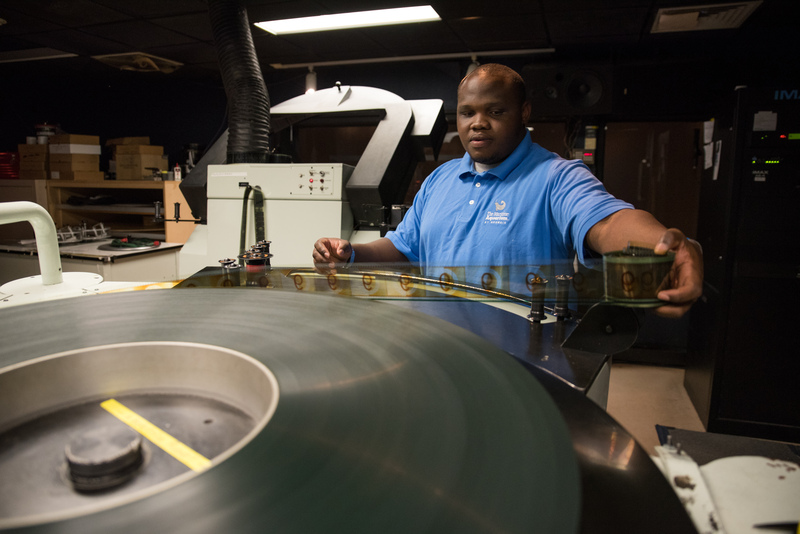 In the final stages of ‘threading’ the 70mm film, Dwayne Blyden passes the filmstrip behind the lens of the IMAX projector at the Maritime Aquarium in Norwalk, Conn. on May 4, 2016. 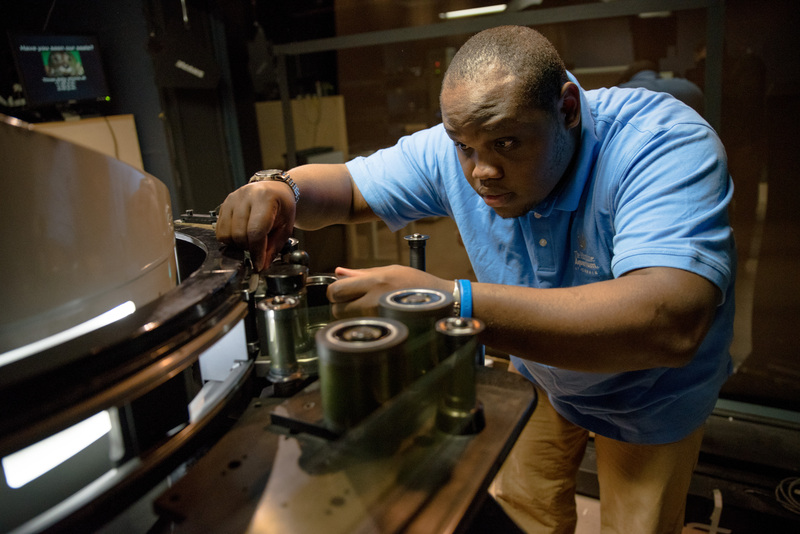 Projectionist Dwayne Blyden fixes the ‘leader’ – the beginning of the filmstip – to the tray that will pull the rest of the movie across the projector’s lens. 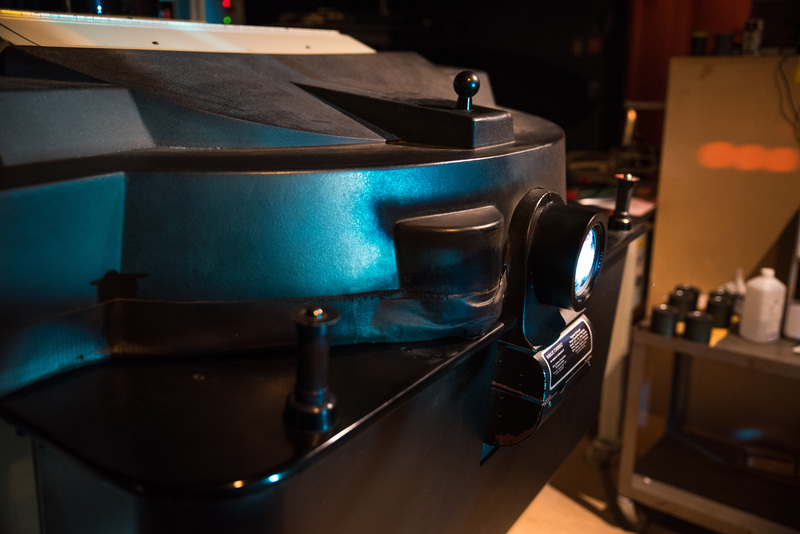 Norwalk, Conn on May 4, 2016. 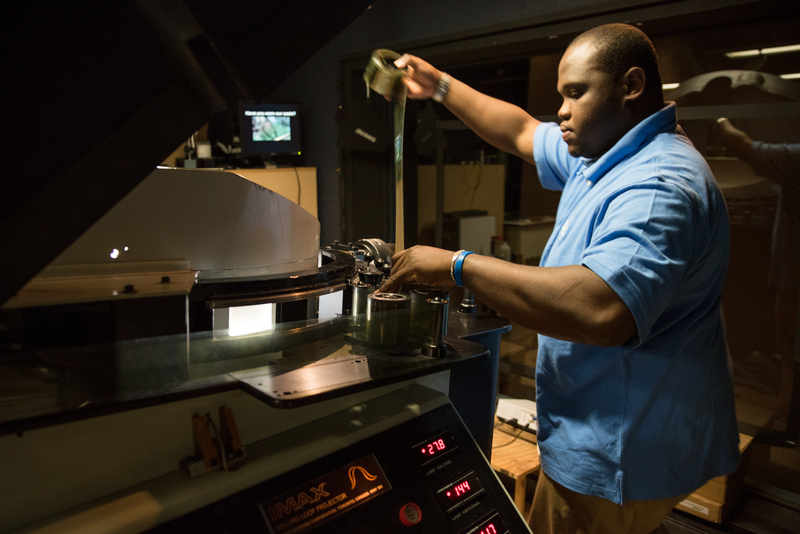 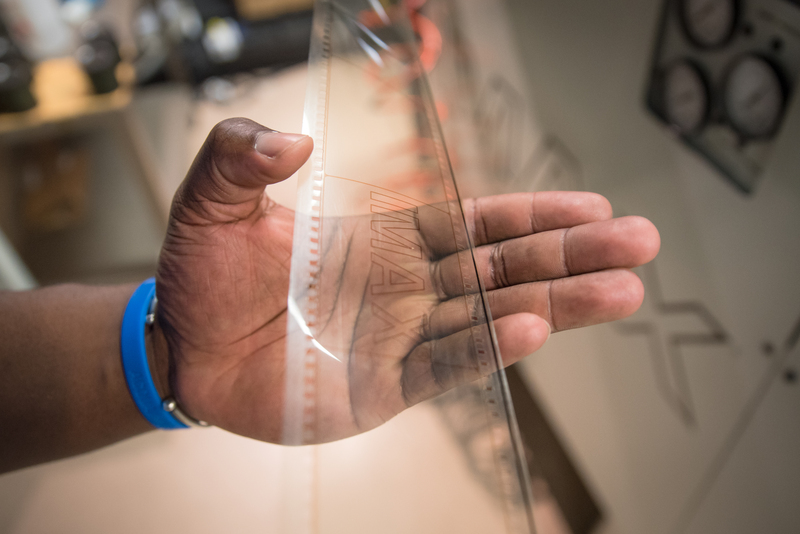 Projectionist Dwayne Blyden holds a frame of 70mm IMAX film that displays the format’s logo. 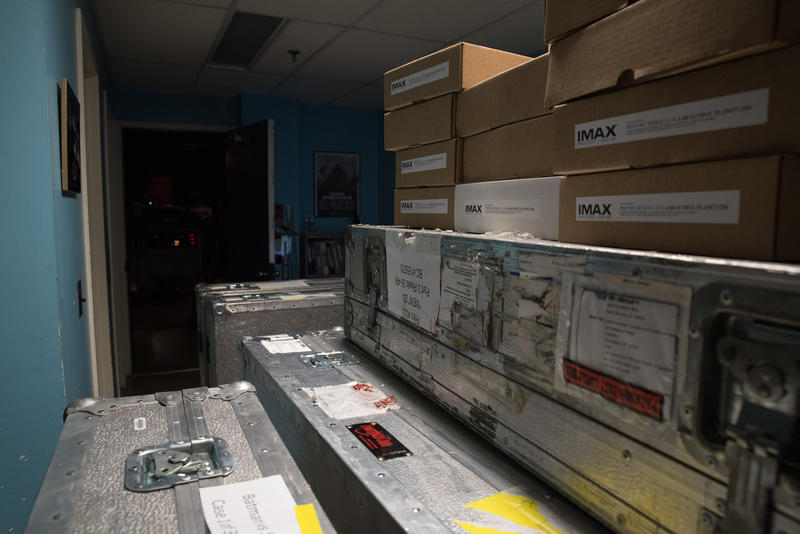 Norwalk, Conn on May 4, 2016. 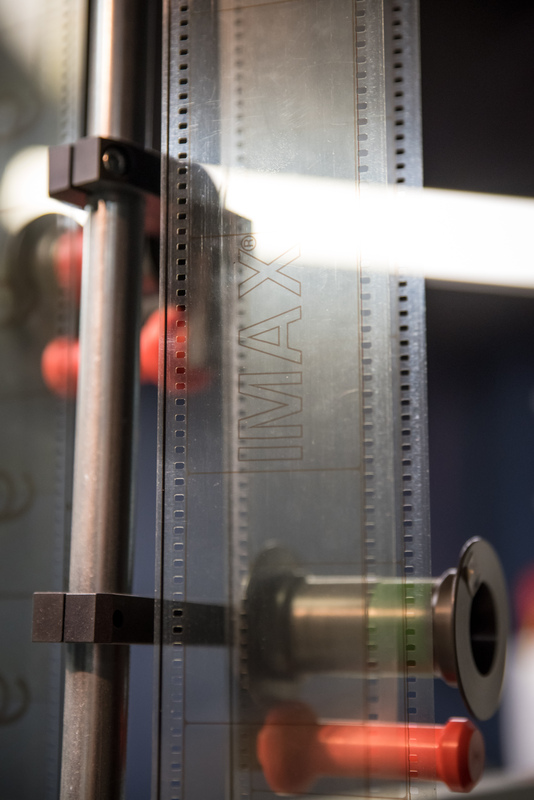 The IMAX logo on a single frame of 70mm film. 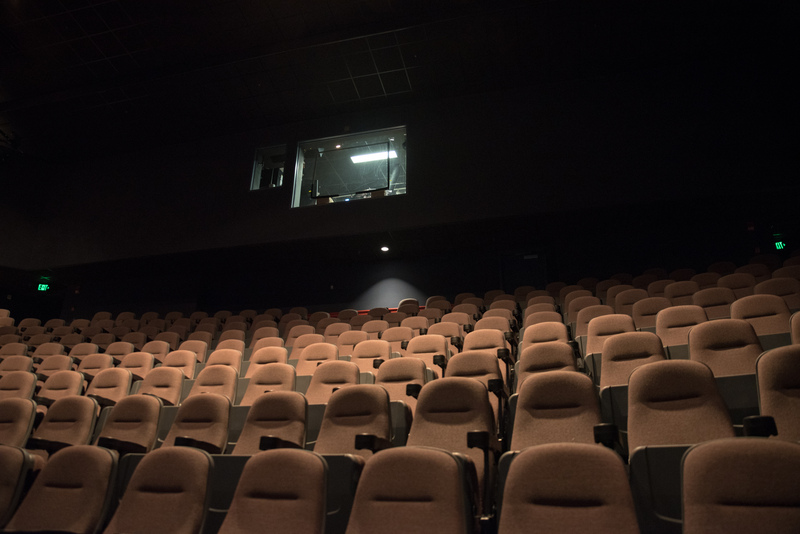 Norwalk, Conn. on May 4, 2016. 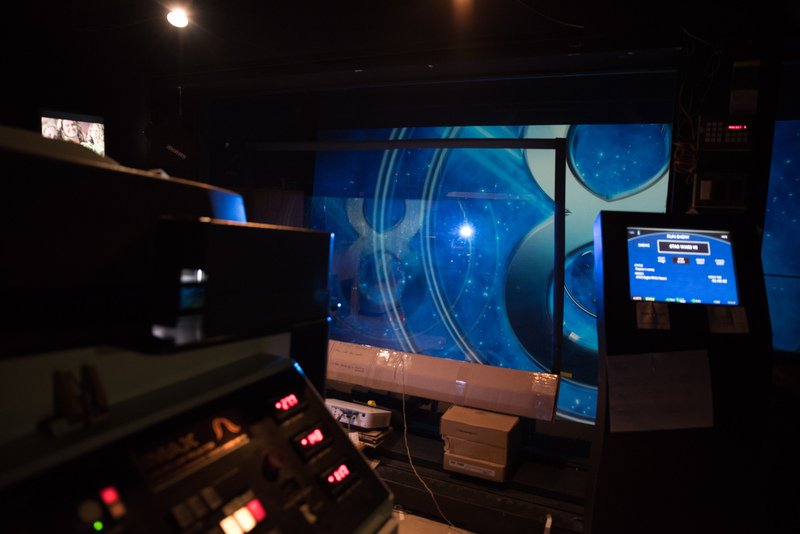 The IMAX projection room seen above the theater seats at the Maritime Aquairum before a showing. 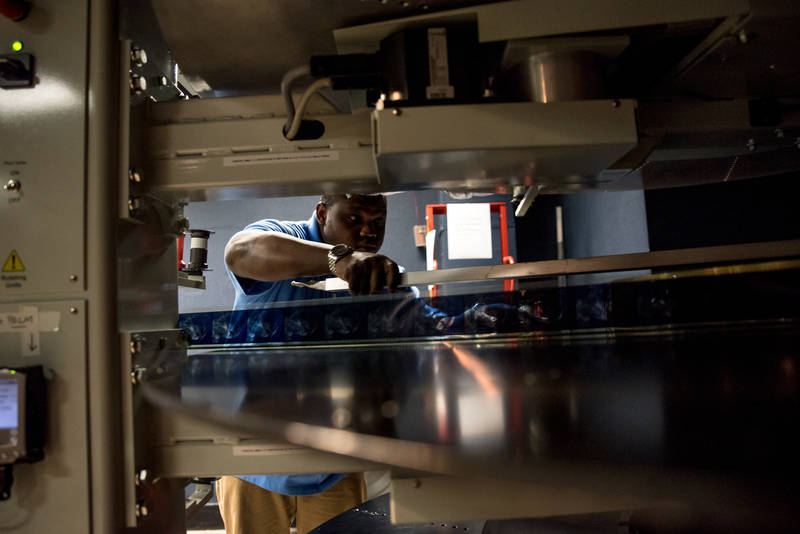 Norwalk, Conn. on May 4, 2016.